The law was discussed over and over and was amended several times in the past weeks, for the simple reason that the state’s treasury can’t afford a wage raise that will cost it 5.5 million Dollars. Didn’t they notice by mistake that the MPs (127) and ministers(29) – I don’t know if the VPs in the cabinet and parliament are counted like PM or MPs – have a raise of 2666$ and the troika (President, PM, Speaker) each have a raise of 4000$? Didn’t they notice during their thorough investigations that this would make a total of 427000$ (Out of the 5.5 Million Dollars), which is almost 8% of the money that should be paid to civil servants according to the law? If the law is such a burden why depriving the poor civil servant from his right – in the name of austerity – while the more or less useless hike for the officials can be abolished, or at least diminished? And the best part is that nobody spoke of the officials’ hike until today, as if they were trying to hiding it, all of them. 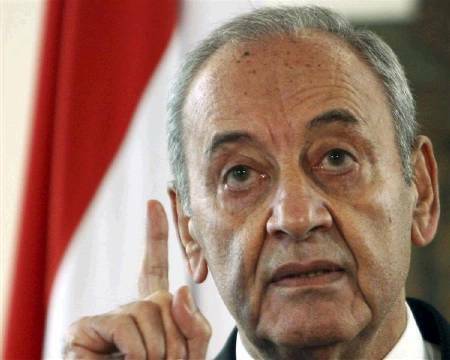 Nabih Berri probably wants to appear like the humble – Robbin Hoodish – Speaker who wants to take from the rich and give to the poor. Te get extra votes, of course. Just in case we had oil in our EEZ, we don’t have it anymore. Posted in Lebanese Politics, Nabih Berri, Oil, Politics on September 12, 2012 by Ramez Dagher.